We have been getting to know the Little Asby Hawthorn pretty well, visiting repeatedly, day and night, in winter, spring and summer. But what we really need to help us find out more about the land that the Hawthorn stands in, is an expert. In the space of a few hours with botanist Deborah Land from Natural England, we learnt more than we have learnt in a year. 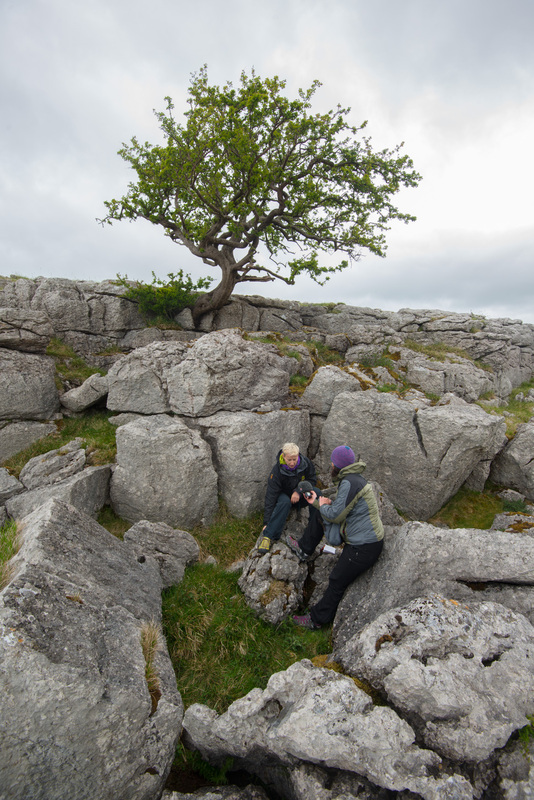 Understanding the ecology of a limestone tarn. Within a few paces we have seen what Deborah calls a mosaic of habitats, from the nutrient rich dunging areas by the wall to the more open land, where heather is growing, and we find our favourite from this year, the delicate bird’s eye primrose. It seems very rich to us but Deborah says that it could be better and getting grazing levels right is an ongoing challenge. Sheep tend to eat heather in the winter, and flowers in the summer, while cattle are less selective and allow the varied habitats to thrive. We have yet to wander into the wet fen-type habitat around the tarn and peer into the clear deep waters of some of the springs there, but have been told that some species of snails that live there are remnants from the last ice age. This land holds a lot of history in its flora and fauna. We gaze at the dark surface of Sunbiggin Tarn, which is fringed with sand-coloured reeds and rushes. We’ve seen reed buntings here before and heard snipe, but today don’t spot any – most of the birdsong we hear comes from meadow pippits and skylarks, and the usual pair of swans are dipping into the tarn’s dark waters for weeds. Deborah shares her concern about nutrient levels in the water rising, although the reason isn’t clear. As a result, more and more reeds are growing around the tarn. The area covered by water is shrinking, steadily. While we’re looking at what’s growing, we talk about Deborah’s background. She has worked as an ecologist for twenty years, and has recently taken a Masters degree in climate science. Little Asby Common is one of the areas where she liaises with the commoners in the establishment of agreements under the government’s agri-environment schemes, which set stocking levels with an aim to maintaining income for farmers while boosting biodiversity. We wonder – in Deborah’s opinion, why does boosting biodiversity matter? ‘That’s a good question, one I get asked a lot. The more biodiverse a habitat, the more robust it is against change. In the UK, most of our habitats are what you call plagioclimax habitats. We have two climax communities: bogs and woodlands. Beyond that, everything is held at a certain level through management or grazing. Now we’ve pretty much removed all our natural herbivores and large predators so the main architect of these plagioclimax habitats is humans. If we stand back and do nothing, a lot of these habitats will start to grade towards that climax community, either woodland or bog. Looking at the plant life growing in the grykes. We peer into the grykes and spot many different plants: hart’s tongue fern, brittle fern, herb robert, limestone fern, wild garlic, spleenwort and dog’s mercury, an ancient woodland indicator. This area has been felled, and grazed, for a long, long time, but the plants tell a story of the long distant past, and show more recent changes as well. We get to the tree – it has taken us a long time because we’ve been talking so much and looking at all the plants on the way. Rob and I hadn’t made a firm guess about the Hawthorn’s age so we’re interested in what Deborah says. She pauses and says it is probably hundreds of years old. I hadn’t expected the estimated figure to be so high. This tree is squat and compact, but its small size tells more about its environment than about its age, which is told, rather, in the gnarls in its bark and the solidity of its trunk. How much longer might it last? This summer’s leaves seem sparse and there were very few flower buds. But because we have only just begun to get to know this tree, we don’t know if that is normal or abnormal for it, and will have to observe it for several more summers before we can gauge its health. After an hour on the scar we are shivering. The wind is cold, as it so often is up here. Maybe that’s why the tree only puts out a handful of flowers – just enough to satisfy a few hardy insects and birds. Despite the less than balmy climate though, we all agree this is a special place, and Deborah remembers a photograph she took here, many years ago, in mist. She reflects again on why protecting a biodiverse countryside matters. We will be learning from Natural England’s local team at each of the seven trees in the next few months and will share what we learn on our public walks and on this website. We’re looking forward to it. 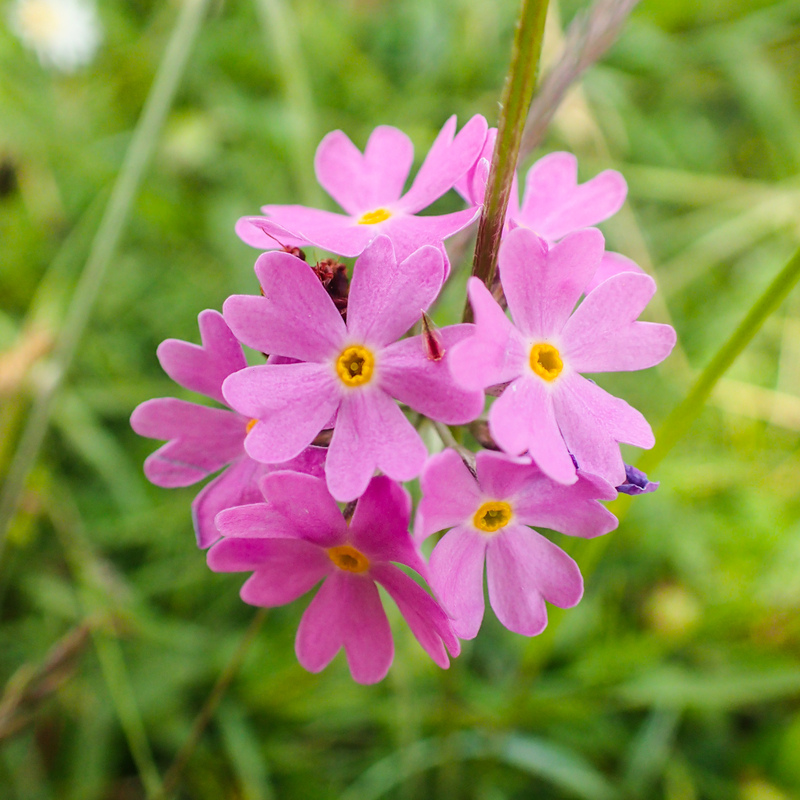 More information on Little Asby Common Ecology from this PDF : Little Asby Common Ecology.